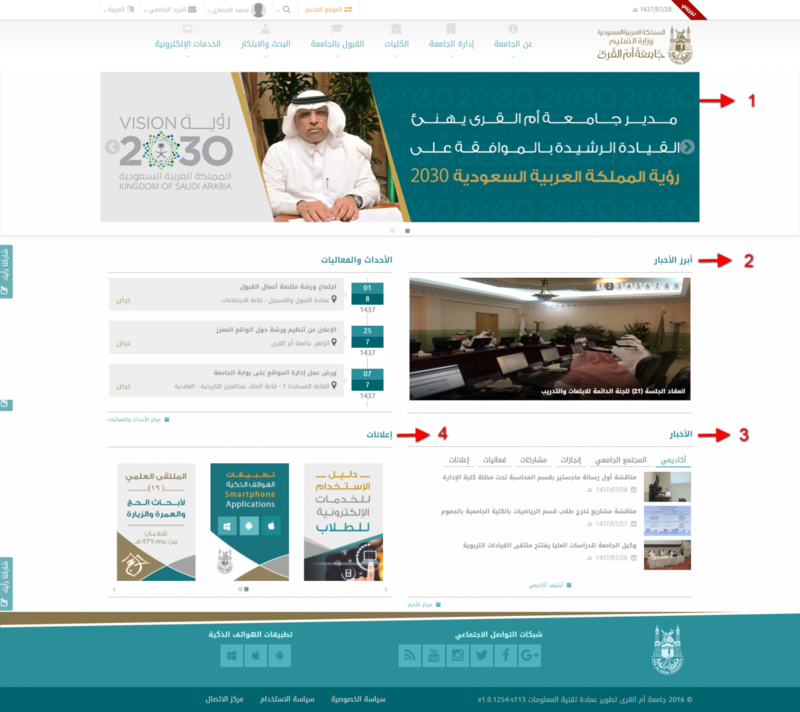 The news, events and advertisements posted at the main page of the University website form a key pivot and a platform through which the browsers, both University students and visitors, see the content in general., and, this helps assess the level of performance, advancement and effectiveness. As such, a mechanism has been set to regulate and achieve success for the website. Such a mechanism is meant for filtering the posting and regulating the content in designing and editing. This in turn contributes to moving the website forward. It includes the most prominent events at the University. These events are characterized with their resonance and impact on elevating the University, and showing it in a way imprints on the browsers’ mind. Achievements and awards received by the University or any of its annexes in terms of deanships, colleges, institutes and centers. Leading events belonging to the University as a whole. Events related to admission and enrollment-postgraduate studies-students’ affairs such as enrolling, appointing and graduating. Vacancy posts of the Academic Staff Affairs Deanship and employees. Communication agreements between the University and international institutions. Scientific symposia and conferences held or organized at the University. Such article involves the most outstanding achievements and news related to the university president, deputies or committees. News related to the University President and his deputies. Development and expansion projects at all the university branches, inaugurated by the University President. Achievements of all entities inaugurated or attended by the University President. Other posts made upon the directives of the University President or any of his deputies. It appears at the website under “Latest News”. It displays the dates of the academic, social and scientific activities in relation to all the subdivisions at the University. Events held at the University. Workshops organized at the University. It includes the news tackling the achievements or events organized by all entities at the University, and it has no connection to employees. It involves each incident related to the study, tests, tables, enrollment, specialty tests and dropping out; that’s to say, all that has to do with the educational process at the University. It covers all that is related to the university Community in terms of promotions, recruitment or social occasion such condolence-pay, congratulating, personal achievements. It involves each news related to an entity participating in an event with body outside the University. It refers to each event, organized by the University or any of its entities, and taking place within or outside it. It is related to each event or news published about the University in the local, regional or international papers. It refers to each personal or collective achievement made by the University or any if its entities. It is related to each news item about academic staff members. Each news item covers the University’s staff. It refers to each news item related to the University’s students. Each news item involves a scientific research done by any of the University academic staff members. Personal photographs except the University President and Vice Presidents. News and pages holding scanned documents. Editing the news bearing the name of the academic entity, and not the name of its head in order to highlight the team work spirit. The period of posting “Banners” ranging from 7-10 days. Posting on the “Banner” communicating with the University visitors or its students. Images posted with dimensions suitable to the space designated for them, and compatible with their original dimensions; length and width. The content of images free of dictation or editing errors: they will be returned to the entity posted them. Attachment: a figure demonstrating the news, event and post positions.